As fashion bloggers, we love finding great brands and deals for our readers. 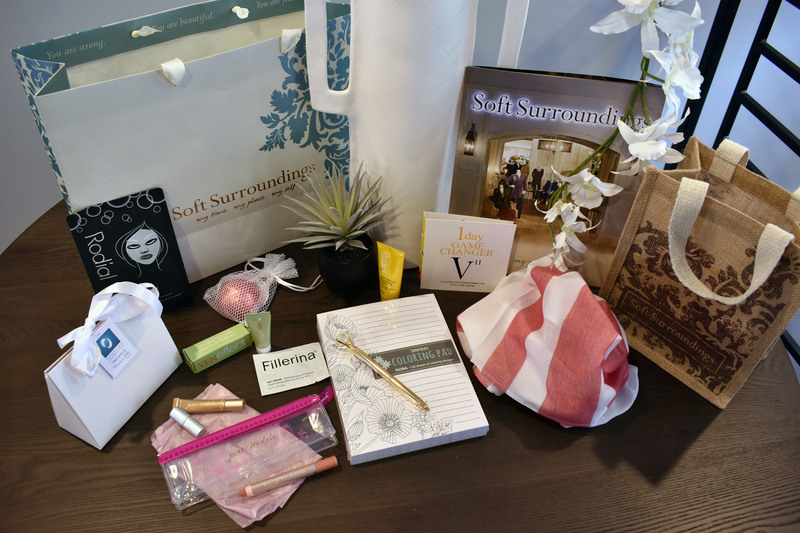 And when we were contacted by Soft Surroundings to attend their grand opening at the Promenade in Marlton, NJ we were intrigued to learn more about what their brand was about. Neither one of us had ever heard of Soft Surroundings (a shame really) and our first instinct was to check out their website. We were pleasantly surprised by the number of products they offered and couldn’t wait to visit them in person. As we walked into the store, we were instantly welcomed by their friendly staff and a soothing aroma that filled the store. The store greeter introduced themselves and started asking questions about us, our hobbies and lifestyle. Why do you ask? Soft Surroundings’ motto is all about looking your best and feeling fabulous from head to toe every day. They want to understand each potential customer a little bit more so they can recommend styles that work with their lifestyles. We were blown away by their attention to detail and how every employee presented themselves the same way to each and every guest that walked through their doors. As we walked around the strategically designed store, employees explained to us what Soft Surroundings is striving to accomplish. They understand that women, in general, don’t always put themselves first on their priority list. Soft Surroundings’ philosophy is to help women take the time to put themselves first from their clothing, make-up, skincare, accessories and even their home decor! When you work on putting yourself first, you can take better care of those around you, which can lead to a healthier, happier life. As you can see from the store photos, you feel the sense of ease and comfort everywhere you look. Soft Surroundings isn’t just a clothing store; they have so many options for women of all ages. Home décor, i.e., the bedroom, is one of their primary focuses. After a long hard day of being on the go, they want your bedroom to feel like a retreat night after night: comfortable, stylish and a place of relaxation. We found ourselves drawn to the effortless elegance of their bedding. Everything is high quality and proof tested before being showcased online and or in stores. If you’re like us and don’t have a ton of skills in interior design, they have a designer program to help create your perfect retreat. As we continued walking the store floor the excitement never lowered. We uncovered more offerings such as adorable knickknacks, rugs, fragrances, beauty products, accessories, and even more. We loved watching the excitement on other shoppers’ faces as they found item after item that they loved. With everything they offer, Soft Surroundings is proving to be a one-stop shop for women. The only thing missing was a glass of wine and hors d’oeuvres! The opening launch party was nothing short of remarkable. The staff was incredibly knowledgeable and welcoming. They prove their mission with every customer that walks in the door – to look and feel your best every day and no matter what you are looking for, they have something for you. Not only did we leave with some amazing takeaways, we have already ordered multiple items online. We can’t wait to go back to see the original staff members who made us feel so welcomed and educated us on a company that is truly leading the way of making a difference for hard-working women. Check out Soft Surroundings today and let us know what you think. Find a store near you for a wonderful experience. If you don’t have one near you, be sure to check out their online store for great finds. Share your top item or one that is currently in your shopping cart. Thank you again to the Promenade in Marlton, NJ team and those from corporate on making our experience grand.